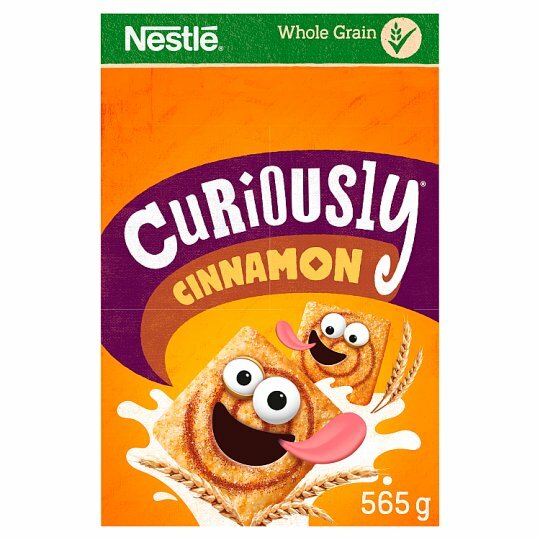 There's only one word for NESTLE CURIOUSLY CINNAMON breakfast cereal - scrumptious! Crunchy toasted wholegrain squares with a delicious cinnamon flavour swirl. Fortified with 9 vitamins and minerals including calcium and iron. Containing 33% whole grain and a source of fibre, they offer an irresistible treat at breakfast times. A tongue tinglingly different way to start your day! Enjoy a cinnamon taste sensation for breakfast. Serve with cold milk or, for a greater cinnamon experience, also delicious with hot milk.